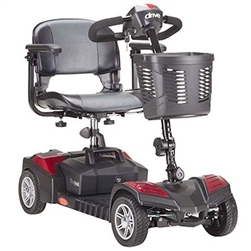 It can go nearly 9 miles on a single charge and has a tight turning radius of 39.4". Also included for the user's convenience is a spacious basket and a pair of full-length armrests. The Zip'r 4 is lightweight, making it simple to transport. It doesn’t have wires that need to be connected, so you can assemble it in 20 seconds. 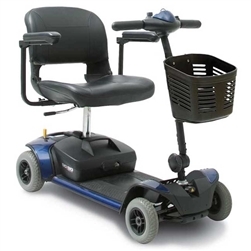 It's capable of reaching speeds of 4.5 mph, and can travel up to 10 miles on a single charge. EV Rider Xpress a 450 Watt a 4-wheel Electric Mobility scooter that rides and acts like a 3-wheel scooter. It features a fully functional suspension, with an articulated front end and a shock absorber in the rear. Travel Mobility 4-Wheel Scooters have 4 wheels and allow for a much stable ride. 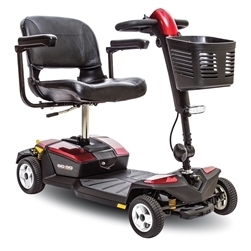 These scooters are most reliable when it comes to comfort and use on rough terrain.